GOP tide rolls on in Ohio, swing state now Trump country? COLUMBUS (AP) — Ohio Democrats can’t worry right now about how to turn Ohio blue. First, they have to figure out how to get it back to purple in a state where President Donald Trump is a force for Republicans. Republicans on Tuesday again swept the races for governor and four other state offices. That’s the third-straight election they’ve done that, and notably this year, all five of the offices were open. 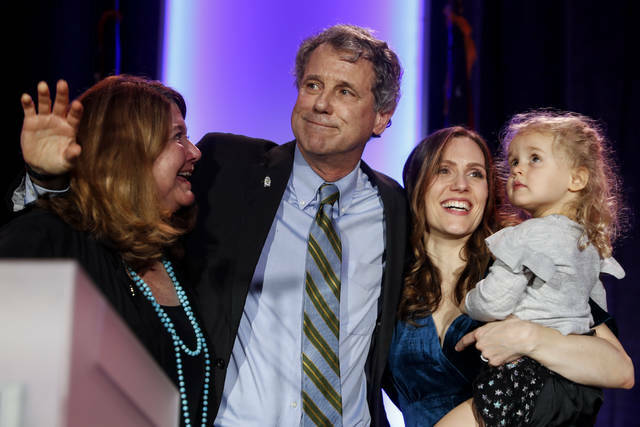 They couldn’t topple the Democratic colossus in the state, Sen. Sherrod Brown, who handily won his third term and the 16th of his 17 elections starting in 1974. Democratic candidates also won two Supreme Court seats, with one going to Melody Stewart, the first female black judge elected to the state’s highest court. The GOP kept its 12-4 majority in the U.S. House delegation, and retains control of the state Senate and House. Trump on Wednesday cited Ohio and Mike DeWine’s victory in the governor’s race as among Tuesday’s highlights. Ohio Democratic Party Chairman David Pepper said the overall results were “very disappointing,” especially after Democrats ran good races and saw strong turnout. “Ohio is fundamentally, in off presidential years, a red state,” said Mike Dawson, who runs a website devoted to tracking Ohio election results. 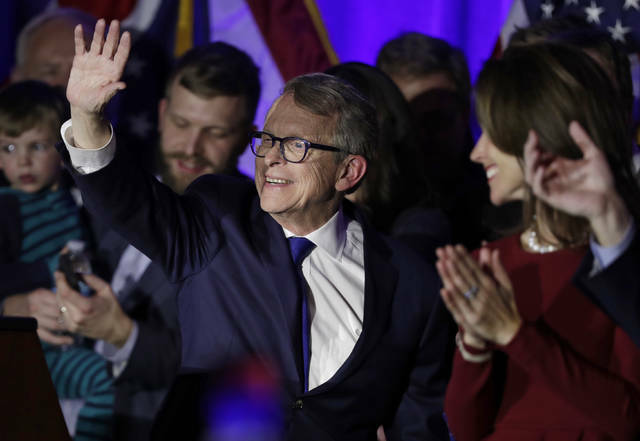 DeWine, the Republican attorney general and a former U.S. senator, defeated Democrat Richard Cordray. With all precincts reported, unofficial results showed DeWine had nearly 51 percent of the vote to 46 percent for the former Consumer Financial Protection Bureau chief. Third-party candidates took about 3 percent of the vote. GOP candidates also won races for attorney general, auditor, secretary of state and treasurer. Voters soundly defeated a measure that would have classified possession of certain types of illegal drugs as misdemeanors. “The fact that we won by the margin we did was a surprise,” he said at an event announcing his transition director, communications director and director of children’s initiatives. The traditional Democratic formula of winning big in the state’s largest urban areas and staying close in swing counties hasn’t been working out lately. DeWine and Husted held Cordray to less than 60 percent of the vote in urban counties containing Cleveland, Columbus, Cincinnati, Toledo and Dayton and beat him by 18 points in those cities’ suburbs. Cordray won about 59 percent of the vote in Ohio’s six most populous counties, while DeWine scored 60 percent of the vote across the rest of the state. Democrats still have a big disadvantage with white voters in Ohio’s small towns and rural places. Those voters backed DeWine by about 2 to 1, according to VoteCast. Losing Montgomery County is nearly always a bad sign for Democrats, and DeWine carried the Dayton area county that neighbors his home county of Greene. Husted also has Dayton ties, from attending the University of Dayton and then representing the area in the Statehouse. Cordray did better than Hillary Clinton in 2016 in the Mahoning Valley area that includes Youngstown, winning Trumbull County after Trump carried it. But many blue-collar Democrats who crossed over for Trump are continuing to vote Republican. Vote totals from the last close governor’s race, when current Gov. John Kasich unseated Democrat Ted Strickland in 2010, underscore GOP gains. Strickland won 62 percent of the vote in Trumbull County, compared to 51 percent for Cordray, and 66 percent in Mahoning County, compared to 55 percent for Cordray. The AP’s VoteCast survey showed DeWine’s victory reflected a strong showing among men, older voters and people in small towns and rural areas. Cordray only managed to split the vote with DeWine among women and had just a slight edge with voters under age 45. But older voters outnumbered younger voters. The AP’s VoteCast also found two of every three voters said Trump was a factor in their vote. Marketing consultant Gary Smith of the Columbus suburb of Dublin said Trump was a “big factor” for him, as was a strong economy. Trump made four campaign-season visits to Ohio, including Monday in Cleveland. After his decisive 8-percentage-point victory in Ohio in 2016 and another strong GOP statewide showing Tuesday, the future Democratic presidential nominee might decide to bypass Ohio in favor of other traditional swing states that appear more inviting. “It really seems that Ohio is solidly Republican and in the Trump Republican column for 2020 and the foreseeable future,” said Suzanne Marilley, a political scientist at Capital University. She said that could change if the economy falters and depending on the Democratic nominee and other state challengers in 2020. Putting Brown on the national ticket would keep Ohio in the 2020 spotlight. He has professed that he has no burning desire to run for president, but Clinton vetted him as a running mate and he could fit well with potential 2020 candidates such as California Sen. Kamala Harris, Massachusetts Sen. Elizabeth Warren or New Jersey Sen. Cory Booker. Pepper said Brown definitely should be in the conversation for 2020, as a Democrat who can win back Midwest states that Trump carried in 2016. Brown said in his victory speech after defeating Trump-backed 4th-term U.S. Rep. Jim Renacci that his victory showed that “progressives can win and win decisively in the heartland.” He said he won “without compromising” on women’s rights, civil rights of LGBTQ rights and without “caving” to Wall Street, drug companies or the gun lobby and instead celebrating the dignity of work. “This is the message coming out of Ohio in 2018 and that is the blueprint for America in 2020,” Brown concluded.